What are the signal words that you used to make your decision for question 1? What type of text structure is used in the section"Iceberg Ahead?" What are the signal words that you used to make your decision for question "Iceberg Ahead"? What type of text structure is used in the section"A Closer Look at the Sinking?" What happened just after Captain Smith went to bed on April 14? Why didn't the watertight compartments keep the ship afloat? What is the main idea of section 1? Use the correct graphic organizer to find the main idea of section 1. Please provide details in your branches. The details do not have to be written in a complete sentence. 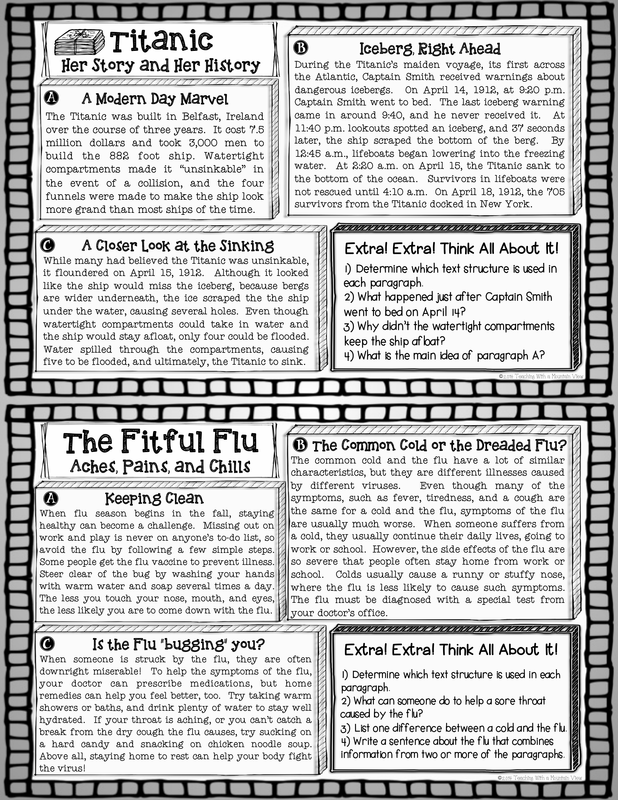 What type of text structure for the section titled "The Common Cold or Dreaded Flu? What are the signal words that you used to make your decision for "The Common Cold or the Dreaded Flu?" What type of text structure did you use for "Is the Flu ""bugging you?"" What are the signal words that you used to answer question 15? Create a venn diagram and show a difference between a cold and the flu. Please provide text evidence for your answer. Your text can be placed in bullets to support your differences in your venn diagram.